In southern California, angry protesters made a human wall to block three buses that carried undocumented immigrants. The buses were forced to turn around without any clear destination. 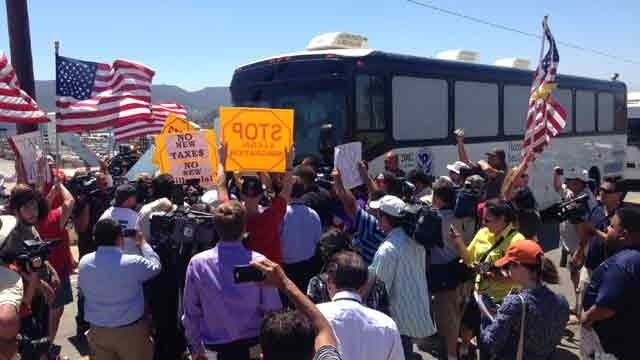 The immigrants were traveling from the southern part of Texas to outside of San Diego for processing at the Border Patrol Station in Murrieta, when the angry protesters blocked their path. The protesters were chanting, “USA” “Impeach Obama” as well as “Deport, Deport.” A yelling match that reached fever pitch ensued between a number of counter-protesters and the demonstrators. After the three buses had turned around, those on board were driven to the San Ysidro border station. It was not known what was to happen from that point with the 140 immigrants. Several children however were taken to San Diego’s Rady Children’s Hospital with illnesses that were unknown said border patrol officers. The government of the U.S. is struggling to accommodate and process the huge influx of the immigrants, which includes a large number of immigrant children who crossed alone. The government is lacking in beds, sanitary facilities and food. Officials estimate that as many as 80,000 children without their parents will cross from Mexico in 2014 in what has been called by the White House a huge humanitarian crisis. To relieve some of the crowded facilities located in Texas, the undocumented immigrants have been sent to other locations for processing. The police chief in Murrieta said he was to expect to receive 140 immigrants every three days, with another group arriving on Friday. The Murietta furor illustrated the fight between protecting the U.S. borders and family safety. If the children, said one Hispanic advocate, were from Canada this problem would not be taking place. Protesters on the other hand said it did not have anything to do with the nationality of the immigrants. They insisted that that all immigrants needed to enter the U.S. properly and not by crossing the border illegally. Another protester said the identity of the U.S. had become eroded due to the influx of immigrants and said it was not aimed at Hispanics.